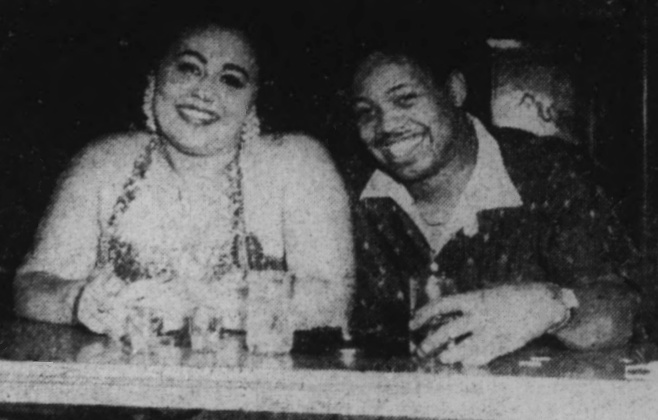 The Above Photo shows Miss Wini Brown, recording star of "Gone Again" and "Be Anything" and Leo Lesser Jr., as they discuss personal management contracts during Miss Brown's recent engagement at the Farm Dell Club in Dayton, Ohio. Wini has been voted the most promising female vocalist of the year. Formerly featured with Lionel Hampton's aggregation, the delovely Miss Brown is currently on tour with the Todd Rhodes orchestra. Universal Attractions, nationally known theatrical agency, is handling Miss Brown's tour.